^ Godfrey Mwakikagile (英語). Statecraft and Nation Building in Africa: A Post-colonial Study（2014年）. New Africa Press. p. 72. ISBN 978-9987-16-039-6. ^ Thomas Pakenham (英語). The Scramble for Africa: White Man's Conquest of the Dark Continent from 1876 to 1912（1992年）. Avon Books. p. 253-255. ISBN 978-0380719990. ^ Thomas Pakenham. The Scramble for Africa: White Man's Conquest of the Dark Continent from 1876 to 1912（1992年）. p. 588-589. ^ a b Thomas Turner (英語). The Congo Wars: Conflict, Myth and Reality（2007年）. Zed Books. p. 28. ISBN 978-1842776889. ^ Thomas Turner. The Congo Wars: Conflict, Myth and Reality（2007年）. p. 29. ^ Bill Freund (英語). The Making of Contemporary Africa: The Development of African Society Since 1800（1998年）. Lynne Rienner Pub. p. 198-199. ISBN 978-1555878061. ^ Bill Freund. The Making of Contemporary Africa: The Development of African Society Since 1800（1998年）. p. 198. ^ Thomas Borstelmann (英語). Apartheid's Reluctant Uncle: The United States and Southern Africa in the Early Cold War（1993年）. Oxford University Press. p. 92-93. ISBN 978-0195079425. ^ Bill Freund. The Making of Contemporary Africa: The Development of African Society Since 1800（1998年）. p. 199. ^ Leo Zeilig (英語). Patrice Lumumba: Africa's Lost Leader（2008年）. Haus Publishing. p. 64. ISBN 978-1905791026. ^ Leo Zeilig. Patrice Lumumba: Africa's Lost Leader（2008年）. p. 64-65. ^ a b Leo Zeilig. Patrice Lumumba: Africa's Lost Leader（2008年）. p. 76. ^ Leo Zeilig. Patrice Lumumba: Africa's Lost Leader（2008年）. p. 65-66. ^ Leo Zeilig. Patrice Lumumba: Africa's Lost Leader（2008年）. p. 66. ^ Leo Zeilig. Patrice Lumumba: Africa's Lost Leader（2008年）. p. 74. ^ Leo Zeilig. Patrice Lumumba: Africa's Lost Leader（2008年）. p. 82-83. ^ Leo Zeilig. Patrice Lumumba: Africa's Lost Leader（2008年）. p. 83-85. ^ a b Leo Zeilig. Patrice Lumumba: Africa's Lost Leader（2008年）. p. 70. ^ Leo Zeilig. Patrice Lumumba: Africa's Lost Leader（2008年）. p. 70-73. ^ Leo Zeilig. Patrice Lumumba: Africa's Lost Leader（2008年）. p. 79. ^ a b Leo Zeilig. Patrice Lumumba: Africa's Lost Leader（2008年）. p. 88. ^ a b Leo Zeilig. Patrice Lumumba: Africa's Lost Leader（2008年）. p. 87. ^ Leo Zeilig. Patrice Lumumba: Africa's Lost Leader（2008年）. p. 89-91. ^ Leo Zeilig. Patrice Lumumba: Africa's Lost Leader（2008年）. p. 93-94. ^ Leo Zeilig. Patrice Lumumba: Africa's Lost Leader（2008年）. p. 96-100. ^ Leo Zeilig. Patrice Lumumba: Africa's Lost Leader（2008年）. p. 100. ^ Leo Zeilig. Patrice Lumumba: Africa's Lost Leader（2008年）. p. 100-101. ^ Leo Zeilig. Patrice Lumumba: Africa's Lost Leader（2008年）. p. 91. ^ a b c Leo Zeilig. Patrice Lumumba: Africa's Lost Leader（2008年）. p. 102. ^ a b Leo Zeilig. Patrice Lumumba: Africa's Lost Leader（2008年）. p. 103. ^ a b c Didier Gondola (英語). The History of Congo（2002年）. Greenwood. p. 118. ISBN 978-0313316968. ^ Leo Zeilig. Patrice Lumumba: Africa's Lost Leader（2008年）. p. 104. ^ a b David Renton、David Seddon、Leo Zeilig (英語). The Congo: Plunder and Resistance（2007年）. Zed Books. p. 118. ISBN 978-1842774854. ^ a b c Didier Gondola. The History of Congo（2002年）. p. 119. ^ a b Leo Zeilig. Patrice Lumumba: Africa's Lost Leader（2008年）. p. 105. ^ a b Paul Nugent (英語). Africa Since Independence: A Comparative History（2004年）. Palgrave Macmillan. p. 85. ISBN 978-0333682739. ^ Paul Nugent. Africa Since Independence: A Comparative History（2004年）. p. 85-86. ^ Michel Struelens (英語). The United Nations in the Congo, Or ONUC, and International Politics（1978年）. Brussels: Max Arnold. p. 48. OCLC 2618699. ^ a b c d Paul Nugent. Africa Since Independence: A Comparative History（2004年）. p. 86. ^ Anthony Mockler (英語). Soldiers of Fortune: 5 Commando, the Congo 1964–65（1986年）1（6）. Orbis Publishing. p. 117. ISSN 0030-4387. ^ Paul Nugent. Africa Since Independence: A Comparative History（2004年）. p. 97. ^ Bill Freund. The Making of Contemporary Africa: The Development of African Society Since 1800（1998年）. p. 201. ^ Paul-Henry Gendebien (フランス語). L'Intervention Des Nations Unies Au Congo（1967年）. Walter de Gruyter. p. 159. ISBN 978-3111137872. ^ Leo Zeilig. Patrice Lumumba: Africa's Lost Leader（2008年）. p. 110-111. ^ a b Leo Zeilig. Patrice Lumumba: Africa's Lost Leader（2008年）. p. 116. ^ a b Leo Zeilig. Patrice Lumumba: Africa's Lost Leader（2008年）. p. 114. ^ Jeanne M. Haskin (英語). The Tragic State of Congo: From Decolonization to Dictatorship（2005年）. Algora Publishing. p. 26. ISBN 978-0875864167. ^ Jeanne M. Haskin. The Tragic State of Congo: From Decolonization to Dictatorship（2005年）. p. 33. ^ Thomas Turner. The Congo Wars: Conflict, Myth and Reality（2007年）. p. 32. ^ a b c Georges Nzongola-Ntalaja (英語). The Congo: From Leopold to Kabila: A People's History（2002年）. Zed Books. p. 108. ISBN 978-1842770535. ^ Leo Zeilig. Patrice Lumumba: Africa's Lost Leader（2008年）. p. 119. ^ Georges Nzongola-Ntalaja. The Congo: From Leopold to Kabila: A People's History（2002年）. p. 109. ^ a b Leo Zeilig. Patrice Lumumba: Africa's Lost Leader（2008年）. p. 117. ^ Georges Nzongola-Ntalaja. The Congo: From Leopold to Kabila: A People's History（2002年）. p. 109-110. ^ Paul-Henry Gendebien. L'Intervention Des Nations Unies Au Congo（1967年）. p. 78. ^ a b c Paul Nugent. Africa Since Independence: A Comparative History（2004年）. p. 87. ^ Paul-Henry Gendebien. L'Intervention Des Nations Unies Au Congo（1967年）. p. 87. ^ Jeanne M. Haskin. The Tragic State of Congo: From Decolonization to Dictatorship（2005年）. p. 30. ^ Paul-Henry Gendebien. L'Intervention Des Nations Unies Au Congo（1967年）. p. 205. ^ Leo Zeilig. Patrice Lumumba: Africa's Lost Leader（2008年）. p. 120-122. ^ Leo Zeilig. Patrice Lumumba: Africa's Lost Leader（2008年）. p. 122. ^ Georges Nzongola-Ntalaja. The Congo: From Leopold to Kabila: A People's History（2002年）. p. 111. ^ Jeanne M. Haskin. The Tragic State of Congo: From Decolonization to Dictatorship（2005年）. p. 29. ^ Georges Nzongola-Ntalaja. The Congo: From Leopold to Kabila: A People's History（2002年）. p. 94. ^ Jane Boulden (英語). Peace Enforcement: The United Nations Experience in Congo, Somalia, and Bosnia（2001年）. Praeger Pub. p. 35. ISBN 978-0275969066. ^ a b c d Jane Boulden. Peace Enforcement: The United Nations Experience in Congo, Somalia, and Bosnia（2001年）. p. 36. ^ Jane Boulden. Peace Enforcement: The United Nations Experience in Congo, Somalia, and Bosnia（2001年）. p. 38. ^ a b Jane Boulden. Peace Enforcement: The United Nations Experience in Congo, Somalia, and Bosnia（2001年）. p. 40. ^ Jeanne M. Haskin. The Tragic State of Congo: From Decolonization to Dictatorship（2005年）. p. 36. ^ Georges Nzongola-Ntalaja. The Congo: From Leopold to Kabila: A People's History（2002年）. p. 36. ^ a b Bill Freund. The Making of Contemporary Africa: The Development of African Society Since 1800（1998年）. p. 202. ^ Paul Nugent. Africa Since Independence: A Comparative History（2004年）. p. 88. ^ Renee C. Fox、Willy de Craemer、Jean-Marie Ribeaucourt (英語). "The Second Independence": A Case Study of the Kwilu Rebellion in the Congo（1965年）. Comparative Studies in Society and History 8 (1). p. 78. JSTOR 177537. ^ Anthony Mockler (英語). Soldiers of Fortune: 5 Commando, the Congo 1964–65 7 (26)（1986年）. Orbis.The Elite. p. 116-117. ISSN 0030-4387. ^ Anthony Mockler. Soldiers of Fortune: 5 Commando, the Congo 1964–65 7 (26)（1986年）. p. 118-119. ^ Georges Nzongola-Ntalaja. The Congo: From Leopold to Kabila: A People's History（2002年）. p. 135. ^ a b Georges Nzongola-Ntalaja. The Congo: From Leopold to Kabila: A People's History（2002年）. p. 136. ^ Georges Nzongola-Ntalaja. The Congo: From Leopold to Kabila: A People's History（2002年）. p. 138. ^ Georges Nzongola-Ntalaja. The Congo: From Leopold to Kabila: A People's History（2002年）. p. 138-139. ^ Dieter Nohlen、Bernard Thibaut、Michael Krennerich (英語). Elections in Africa:A Data Handbook（1999年）. OUP Oxford. p. 292. ISBN 0-19-829645-2. ^ a b c d Paul Nugent. Africa Since Independence: A Comparative History（2004年）. p. 233. ^ Thomas Turner. The Congo Wars: Conflict, Myth and Reality（2007年）. p. 117. ^ Paul Nugent. Africa Since Independence: A Comparative History（2004年）. p. 234-235. ^ Michela Wrong (英語). In the Footsteps of Mr. Kurtz: Living on the Brink of Disaster in the Congo（2001年）. Fourth Estate Ltd. p. 195-200. ISBN 978-1841154220. ^ Paul Nugent. Africa Since Independence: A Comparative History（2004年）. p. 236-239. ^ a b Leo Zeilig. Patrice Lumumba: Africa's Lost Leader（2008年）. p. 140. ^ Jeanne M. Haskin. The Tragic State of Congo: From Decolonization to Dictatorship（2005年）. p. 39-40. ^ Jeanne M. Haskin. The Tragic State of Congo: From Decolonization to Dictatorship（2005年）. p. 40. ^ a b David Gibbs (英語). 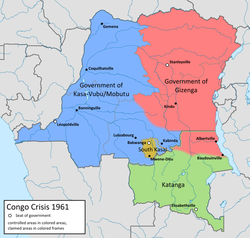 Misrepresenting the Congo Crisis（1996年）. African Affairs 95 (380). p. 453. JSTOR 723578. ^ Thomas Turner. The Congo Wars: Conflict, Myth and Reality（2007年）. p. 149. ^ J. R. T. Wood (英語). So Far and no Further! : Rhodesia's bid for independence during the retreat from empire（2005年）. Trafford Publishing. p. 101、471. ISBN 978-1-4120-4952-8. ^ Paul Nugent. Africa Since Independence: A Comparative History（2004年）. p. 98. ^ Paul Nugent. Africa Since Independence: A Comparative History（2004年）. p. 82. ^ Paul Nugent. Africa Since Independence: A Comparative History（2004年）. p. 89、96-97.